The Honda NAVi mini-bike hasn’t been discontinued. The mini-bike’s production has been paused temporarily even as Honda is working on adding a major upgrade – the combi-braking system. By law, all two wheelers with engine capacity of less than 125-cc need to feature combi-braking. To add this upgrade, Honda has pulled the NAVi off production. The mini-bike will soon be reintroduced with combi-braking system or CBS as standard. Already, all automatic scooters that Honda sells in India feature CBS. In fact, the NAVi too is based on the Activa – India’s best selling scooter, and which has featured CBS for many years now. Keeping that in mind, adding CBS to the NAVi shouldn’t be difficult for Honda. Speculations on the internet suggest that the upgraded NAVi could also get a slightly higher power output and more features. 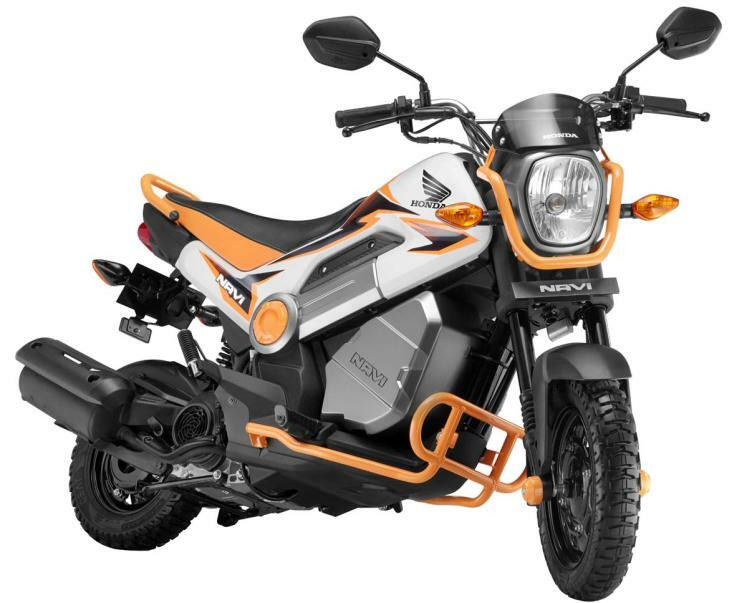 The NAVi is Honda’s least priced two wheeler, selling at Rs. 41,849 ex-showroom Delhi. It’s meant to be a fun way to commute in India’s cities. The NAVi uses the Activa platform, including the scooter’s engine and CVT automatic transmission. The NAVi is powered by a 110-cc, four-stroke engine that produces 7.72 Bhp of peak power and 9 Nm of peak torque. A low kerb weight of 101 kilograms and telescopic front forks means that the NAVi is a zippy ride on city streets. 130-mm drum brakes and tubeless tyres are standard on both wheels. Honda has many customiation options for the NAVi, making the two wheeler quite practical for day-to-day use. The only downside of the NAVi is its tiny fuel tank of less than 4 litres, which give the mini-bike a range of under 200 kilometers considering that it has a rated fuel efficiency of 38 Kmpl. A larger, 6-litre fuel tank could make the NAVi a lot more convenient to use, as trips to the fuel station wouldn’t have to be so frequent. Meanwhile, a few intrepid bikers in India have even ridden the NAVi across high Himalayan passes, just going to show that great things come in small packages.